The future of Rebel Network is nearing, as the dawn of the 4.0 era is closing. Rebel Network will introduce the Rebel Network Theme 5.0, which migrates from the dark-blue and silver theme to the glossy black, orange, and white theme. By that time, RoflcopterCraft will update to its Beta launch, where it integrates with the official Minecraft 1.0. After the updates are done, and after a month or two of the theme, the Rebel Network 5.0 will be in. Merry Christmas and have a good winter break! Sounds good! Keep up the great work on the site maintenance! I'm working on getting the Gmod server! I've got the hardware for a real server, now I'm just looking for a place to host it! My parents said I should click one of my own ads and see how much money I get from it. I did it and my adsense account was deleted. Sorry about your ads bro. i note that the mobile version of the forum is bugged when actually browsing a topic. I'll do the best I can. I tried to go on the forums via Playstation Portable, and it works perfectly. 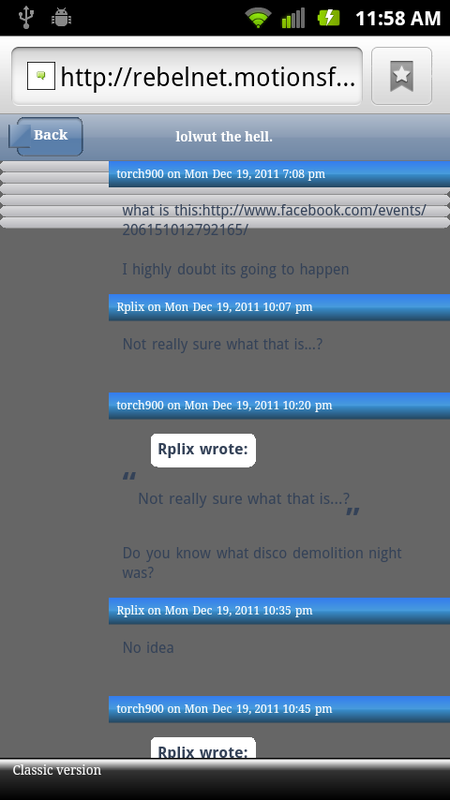 However the new forum design may be the main reason it can't cooperate with mobile devices.